After a year of planning and prepping, the time has finally come! All dates and plans are flexible and rely 100% on weather conditions. July 12th - Leave Gig Harbor, cruise north for 9-10 hours and find a quiet anchorage to get some sleep. 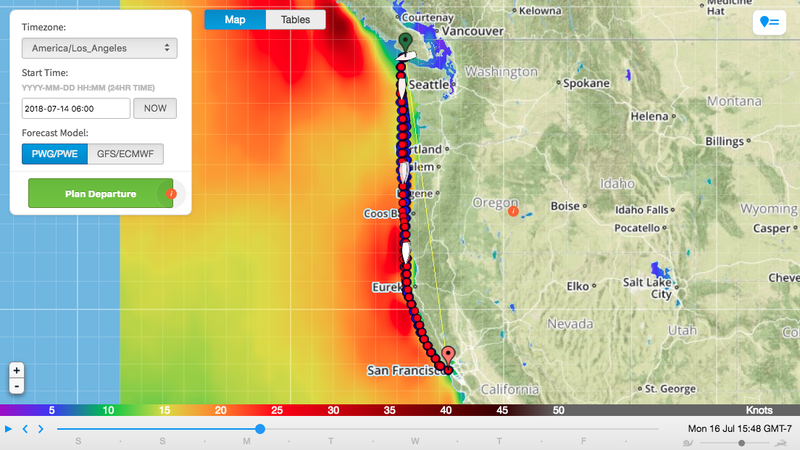 July 14th - Head out into the Pacific Ocean, 20-30 miles off shore. We'll take a southwest course at first and then actually end up heading southeast as we follow the coastline. 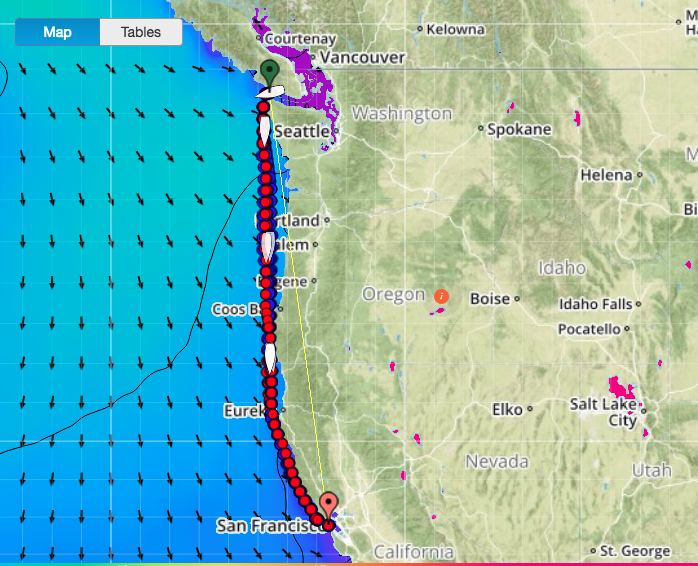 We are watching the weather closely, and this looks to be our best window to cruise from Washington to San Francisco. Any of that could change if the weather changes. That leg of the cruise will take us 4 1/2 days, without stopping. Pat and I will be on 24 hour - 6 hour rotations at the helm - with the kids coming up to join us on 3 hour shifts between 7 am and midnight. This map shows 4 different possible start times and routes so we can choose the best time and path. It also shows that the waves will be coming from the north giving us following seas (that's a good thing). Wave height throughout here is 3-6 feet in intervals of 7 seconds. Not flat - but not bad. This map shows wind gusts. 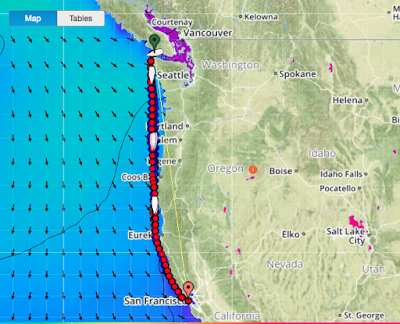 Most of the time it will be 8-20 knots with a windy patch around Cape Mendocino - which is normal. Other maps show that it won't likely rain and the temp will be between 50 & 65 the entire time. We SHOULD enter San Francisco Bay July 18th - not sure what time yet - depends on a LOT of variables, but the closer we get, the more details I will have. We will be close enough to shore so that if something goes wrong, we can get to safe harbors. We have excellent safety gear, a huge first aid kit and lots of redundant emergency devices that notify contacts and Coast Guard of our location if necessary. We don't plan on using any of it, but we have it if needed. We'll be practicing our emergency drills and man overboard drill a few times on our way out of the Puget Sound. We have an Iridiuim Go, which allows us to have satellite wifi, so we should be able to send and receive texts and emails. We'll see how it works! I'll have LOTS of free time, so expect a few blog posts. You can track our boat at any time you want, if you go to www.vesselfinder.com and enter our MMSI # (367658990) at the top of the page or even download the Vessel Tracker app (iPhone only), it will show us in Gig Harbor right now. If all goes well, I'll have hourly location updates on the 'Where is Noeta' blog page. I've been prepping food for a week, so all we have to do is heat it up while underway. We have audio books, games, instruments, DVDs and books. Hopefully enough to keep us busy! We plan on staying in San Francisco July, August and maybe into September. We're in no rush to get to Mexico - we need those hurricanes to be finished. We may head up the delta to Stockton to visit our oldest daughter, Mikayla, and eventually visit Santa Barbara, Marina del Rey, San Diego, Catalina and anywhere else that looks good. We're hoping for a very boring voyage - but hopefully with some beautiful views and lots of sea life! Desejamos um Mar de Almirante durante toda a viagem!!! Um forte abraço a todos, e que Deus os acompanhe meus queridos amigos.